Remind yourself to relax with this wall art painting project. Soft, beach colors, touchable texture and a starfish combine for beautiful decoration for any room (but especially good for the home office). Note: When painting, always apply to top and sides of canvas and allow paint to dry after each application. Place canvas vertically. On edge of left side, mark canvas lightly with pencil and ruler 6" from bottom edge; mark canvas 11" from bottom on right side edge. Refer to photo and draw a curvy line between marks. Refer to photo for placement and attach letter stickers to canvas; adhere well. Use foam pouncer to paint Bahama Blue over letters to avoid seepage underneath stickers; use foam brush to paint remaining lower section of canvas below line. Use 2" brush and dry brush technique to paint Antique White in vertical and horizontal directions over upper section. Use 2" brush and dry brush technique to paint Calypso Blue in horizontal direction over bottom section; follow curve of line when dragging brush across canvas and over sides. (Note: Brush gently over lettering to prevent seepage under stickers.) Remove stickers from canvas. Use sea sponge to apply light coat of Cocoa over upper section. Repeat with Antique White over some areas of upper section. Use flat brush to apply thick coat of Triple Thick Gloss Glaze to lower section for water surface; allow glaze to dry thoroughly. Refer to photo and use sea sponge to apply Snow-Tex thickly across line in irregular width, applying a thinner application on both sides of line. Allow Snow-Tex to dry thoroughly. Refer to photo for position and glue starfish to canvas. 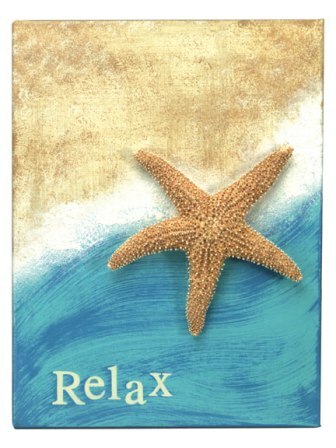 This is a real nice relaxing painted canvas of a starfish to remind you of the ocean which helps me to relax. I like that you can paint any colors on canvas and put what you want to use for your scene. I would also like to use card stock to decorate the background and put some driftwood and then maybe shells on canvas. These will make great gifts for the holidays or even a birthday.